The Fantasy Flyer is an impressive toy sure to delight children. 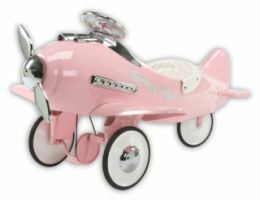 Kids love buzzing down the driveway, through the park and around the block in this great airplane! The bright pink color and vintage decals are only the beginning. The attention to minute detail is evident in the many features and will keep kids focused and entertained for hours. Children will be delighted to see the propeller spin as they pedal! Ages 2-5.